Front Binding – Today’s post comes from a notable English playwright not named William Shakespeare — instead, it’s William Congreve, who rose in prominence in the late 1600s with his theatrical works and poetry. 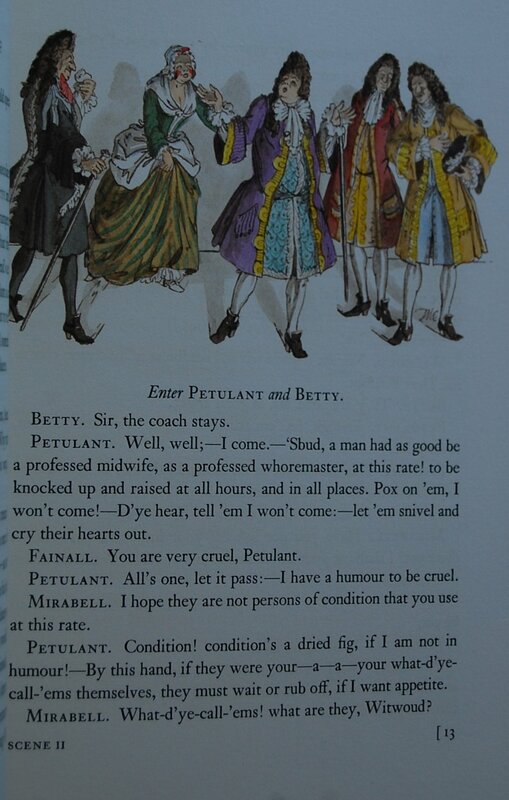 This is probably his best known work, although a few of his lines in The Mourning Bride (1697) have become common parlance in terms of quotation: “Musick has charms to soothe a savage breast [beast]” and “Hell hath no fury like a woman scorned” are paraphrases of Congreve’s actual lines in that play. However, the George Macy Company only showered Congreve with this sole LEC edition (which is also available in a Heritage reprint, with a blue cloth binding if I remember right). This is a rather lovely book regardless of that fact. 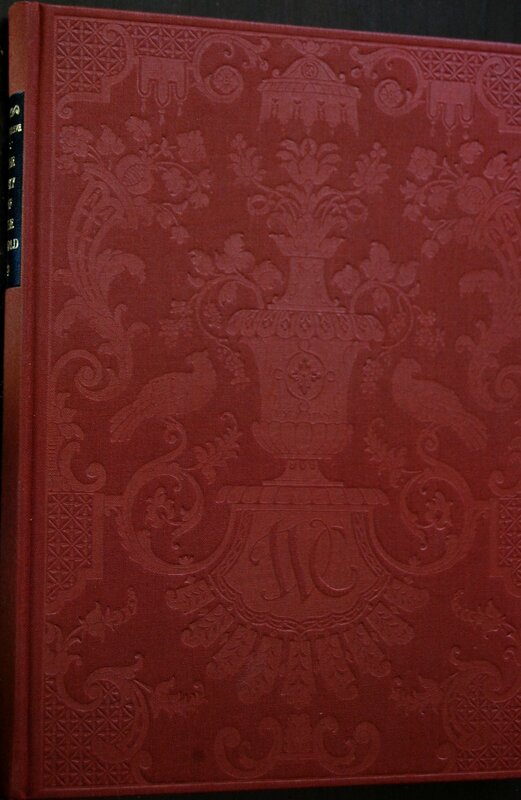 I love this binding, and it’s a book I’ve actually wanted to add to my collection for a while now in either format. 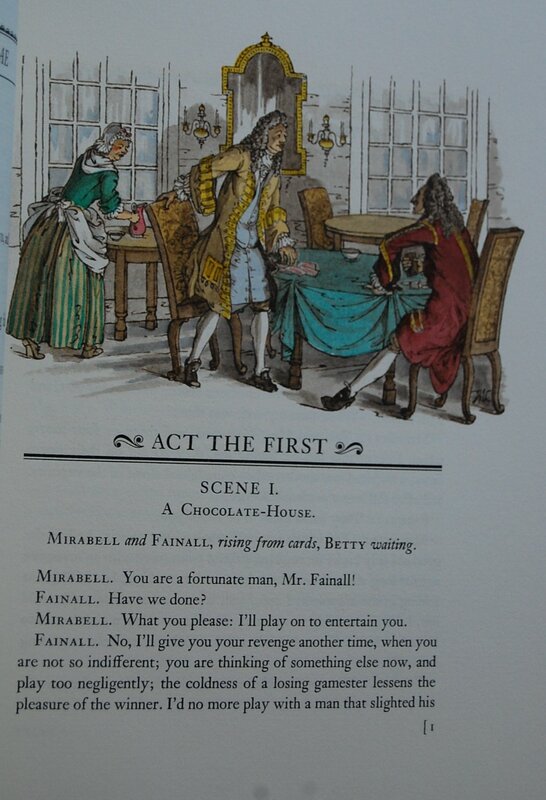 Congreve’s comedic narrative was brought to life by T.M. Cleland, last seen here performing a similar design philosophy for Oliver Goldsmith’s She Stoops to Conquer. Cleland’s bibliography is covered in my Monsieur Beaucaire post (which doesn’t step too far away from this design as well; perhaps it was part of an unstated series). As with those books, he served as both illustrator and designer for this book as well. Thankfully, Cleland’s vision for this set is pretty nice to look at, especially the title page. I also find the illustrations in this book to be reproduced a little better than in Beaucaire. Design Notes – Cleland’s design was executed by A. Colish, with his own illustrations being printed by the Photogravure and Color Company and colored by Walter Fischer’s studio. However, I don’t have a ML nor is one available to me at the moment, so I’m afraid this is the most I can share for now. Front Binding (contrast adjusted to spotlight the detail) – This design is also on the back of the book. Title Page – Cleland has a way of heightening title pages; he’s consistently done some elegant and classy ones over the books we’ve covered of his thus far. And, in a curious twist, Louis Kronenberger is called to serve as the Introduction writer here, the second of at least three collaborations with Cleland. The History of Tom Jones came first, with She Stoops to Conquer following this book. 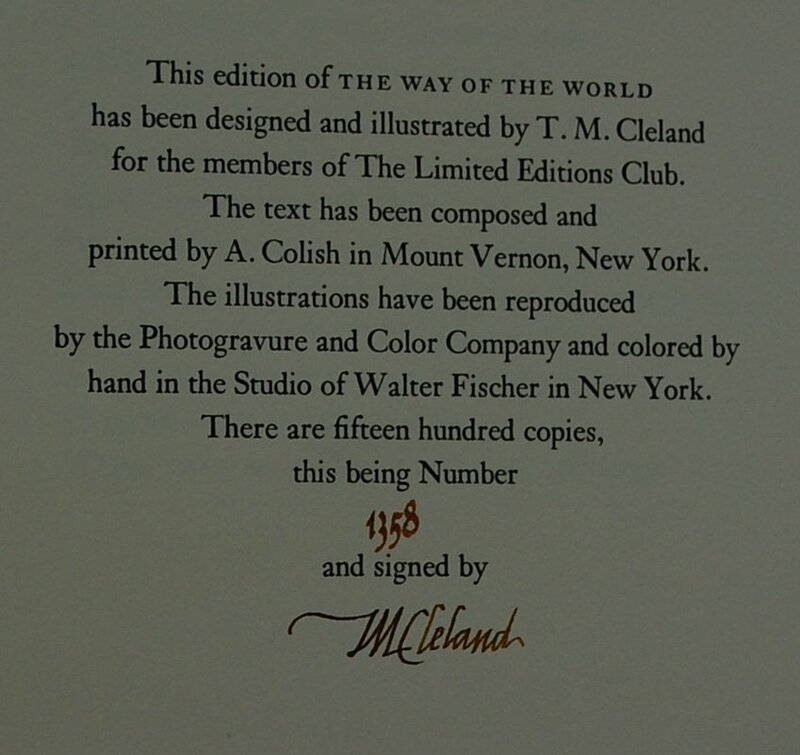 Colophon – This is copy 1358 of 1500 and signed by Cleland. Page 1 – This is easily my favorite Cleland edition thus far; the colors pop really nicely here. Contrast this with the Heritage She Stoops and you’ll see a notable difference. Personal Notes – This is the latest LEC to come into my hands; I actually found it at my local Goodwill a few months ago for $4, along with a second copy of The Three Cornered Hat. I snagged them both, in the hopes that the latter will help me next time I head to Monterey in earning some store credit somewhere. Both were in great condition in terms of the books themselves; the slipcase for this one is a little ragged, but I view that as it doing its job over the years. I adore the binding on this so I’m pleased as punch to have it. 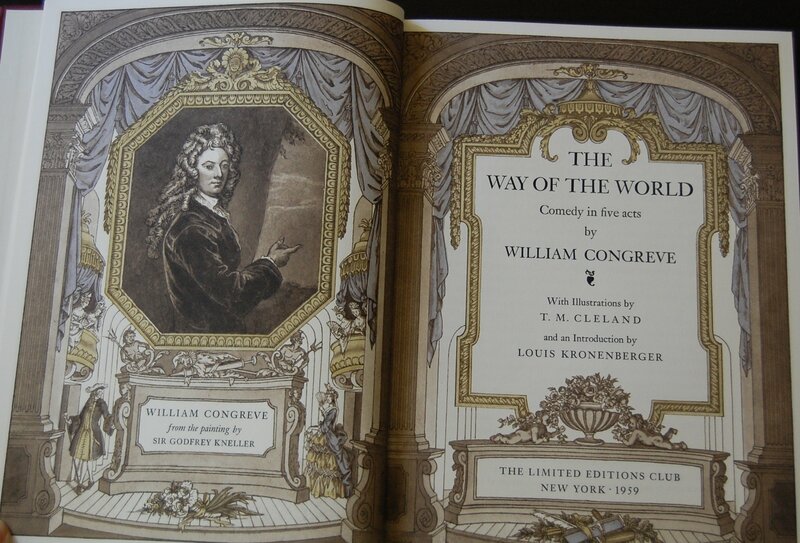 You are currently reading Limited Editions Club: The Way of the World by William Congreve (1959) at The George Macy Imagery.